Many forklift accidents result in serious injuries. Occasionally forklift accidents cause fatalities. It is imperative that anyone who is required to operate a forklift has the knowledge and skills to be able to operate it safely. The aim of this training course is to provide the participants with the knowledge to operate the forklift safely. Key safe operating skills will also be developed. The first session clearly explains the aim of the training course and the reason why this course is being conducted. 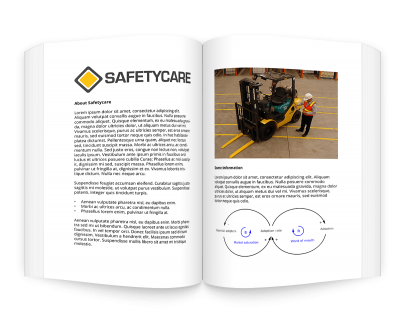 It also looks at the main causes of forklift accidents and some of the most common contributory factors. This session covers in detail the pre-start and operational checks that are required to be done on a forklift. The session covers both the theory and practical aspects of these checks. It also discusses and explains the rated capacity of a forklift. This session concludes by conducting three quick experiential learning exercises. These exercises reinforce the importance of performing thorough pre-operational and operational checks. This session informs the participants about the factors which govern the safe lifting and transporting of loads. It also helps the participants to become aware of specific forklift terminology and recognise the approximate weights of different materials. This session informs the participants of the main causes of lateral and longitudinal instability. It also covers in detail, the procedures for picking up a load from a stack, stacking or placing a load, parking and what to do if you discover a fault while checking or operating a forklift. This session involves the participants in a group exercise which determines the reasons why certain forklift rules have been created and established. This session focuses on putting into practice all the forklift procedures and information that the participants have covered during the course. After there has been sufficient practice on the forklift, the participants are tested to determine their level of practical competence. This final session involves the participants in a thorough review of the forklift training information. The course concludes with the participants completing a written questionnaire.